Was Your Baby's Fetal Stroke Caused by a Doctor's Mistake? A fetal stroke is always a significant medical event. When a fetus suffers a stroke sometime between 14 weeks gestation and delivery, it is known as a fetal stroke. During a fetal stroke, the blood supply to the brain is reduced or completely cut off. After a few minutes, brain cells may start to die and a lifetime of complications may begin. Cerebral palsy primarily impacts the part of the brain that controls movement. It is a lifelong condition that can impact many different parts of a person’s life. A brain injury can result in epilepsy or seizures that may impact a baby for the rest of that baby’s life. Cognitive impairments can impact a child’s ability to meet developmental milestones and a child’s cognitive skills. Learning and activities of daily living may be a lifelong struggle. Sometimes these injuries, and others, occur because of someone else’s negligence. Preeclampsia Was Undiagnosed Or Untreated. If a mom-to-be suffers from preeclampsia, there may be decreased blood flow through the placenta. Decreased blood flow can cause an unborn baby to suffer a stroke. Gestational Diabetes Was Undiagnosed Or Untreated. Unmanaged gestational diabetes can cause several different problems that may result in a baby’s stroke. For example, while the baby is in utero, a baby may suffer from hypertension which can cause a stroke. Additionally, babies born to moms with uncontrolled gestational diabetes may be at risk of having big babies. A big baby can result in difficult and dangerous deliveries. An Umbilical Cord Problem Was Undiagnosed Or Untreated. If the umbilical cord is wrapped around the baby’s neck, for example, the brain may be deprived of oxygen and a stroke can occur. A Placenta Problem Was Undiagnosed Or Untreated. Placental abruption or placental thrombosis can restrict the blood flow to a baby’s brain and cause a stroke. A Baby Was Showing Signs Of Distress And Was Not Promptly Delivered. If the baby’s heart rate slows down, for example, then a prompt C-section may be necessary to prevent a stroke or another serious complication. A Birthing Tool, Such As Forceps Or A Vacuum, Was Used Incorrectly And Resulted In Head Trauma. These tools can cause brain bleeds, stretching of blood vessels, and other problems that impact blood flow to the brain and may result in a stroke. While there are many instances when a fetal stroke may be caused by medical negligence, there are also times when it is not the fault of medical providers. 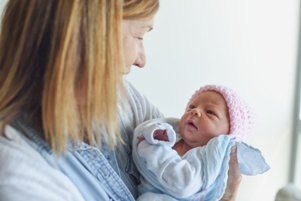 The experienced birth injury lawyers of Gray and White Law, together with our staff nurse, can investigate what happened to your child and, if medical malpractice occurred, we can help you protect your child’s future. It is important to know why your baby suffered a fetal stroke. If the stroke occurred because of someone else’s negligence, then your baby may be able to make a financial recovery that includes compensation for past and future medical expenses, special living costs associated with your child’s injuries, physical pain, emotional suffering, and other losses. To get this compensation for your child, you will need to prove that someone else’s negligence caused your child’s stroke and resulting injury. This will require evidence and persuasive arguments. Our experienced legal team can help you find out what happened to your child and, if appropriate, gather the necessary evidence and make the convincing arguments to get your child a fair financial recovery. Call us at 888.450.4456 , or contact us via this website, at any time to learn more about your child’s rights and potential recovery after a fetal stroke. Did Your Child Have to Suffer a Brain Injury Because of Preeclampsia?